Preamble: With summer coming to a very quick conclusion and we remark upon another amazing season of Derby that never comes to a stop. Falling far behind on words to write and thanks going out to all we’re going to have to work backwards or ramble on a random basis. So don’t feel neglected or rejected if the mentions haven’t been as frequent or forthcoming for we have been forthright pumping up the volume on the photographic side of style and wile while we have been at it. Starting with the most recent and keening backwards we start with le weekend passé. Dear Diary: This has been the weekend of roadtrips – but the most hellish of all has been the trip within this city of Toronto on Sunday. The TTC in all its infinite wisdom blocked off the subway for maintentance between Eglinton and Bloor subway stations, and adding in its stead their version of a shuttle bus service. Compounding the woe, is the 54 bus coming late and only offering the short turn version plus the Terry Fox Run being held in the neighbourhood park down the street with all the cars turning into the park and holding up all the traffic towards the station. And what was beginning as a chilly day rapidly warming up. The shuttle bus decision when we should have gone the other way was only one of a myriad of decisions gone awry. And a Queen Street streetcar that takes forever to arrive, but as we notice during the game itself they came ever so frequently. Yesterday came suddenly. But this is not my story. 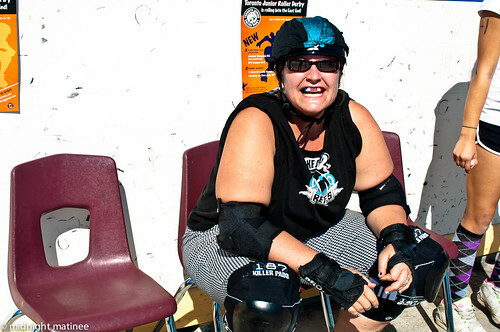 This is the story of a Fun Day with Toronto Junior Roller Derby. Having been corrected on occasion, TJRD is not ToRD Jr but a league unto its own with no affiliation to Toronto Roller Derby, formally fostering Derby amongst the juniors between the ages of 9 to 18 years of age. TJRD has found a new place to skate down amongst the Queen Street East scene at Jimmie Simpson Rec Centre between Broadview and Pape. The tweet of the whistle and the sight of helmets and stripes indicated we had found the place. To some surprise, this bout was being held in the outdoor hockey or lacrosse arena. No goalie nets in sight, but the taped down track and all was ready to go. Some readily recognizable players on the Black and White teams from previous games seen at Ted Reeve or at The Hangar, all ready and able to roll. What had begun as a chilly morn turned into a perfect day to skate in the words of coach Mouth of the South who was once again going against her bench counterpart Lucid Lou. We may have slightly begged to differ, as the Roots pullover and outerjacket was reduced to a black Thunder shirt. The day was not Hammer City hot from the past while outdoors, but it was hot enough to make the camera a baked potato in the hand. This was an ideal Sunday to introduce Derby to the neighbourhood. For this Sunday Funday scrimmage admission was free with donations as you wish. Plenty of Derby moms and dads with cameras in hand to take in all the proceedings of their younglings, but unlike what may be heard at a hockey arena, all that was being heard was the encouragement and no badmouthing. Merch tents from Cardinal Skates and tables with TJRD shirts for sale. A ref crew down to a minimum with no outside refs still meant be careful while you must, but a lack of suicide line meant a camera vantage point not to be taken for granted. 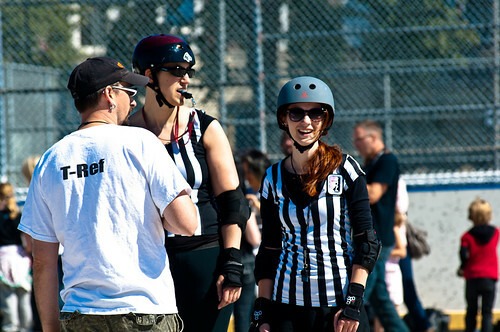 T-Ref was centre stage sans stripes as a timekeeper while R’effin Adora Bell and crew kept the players in line. 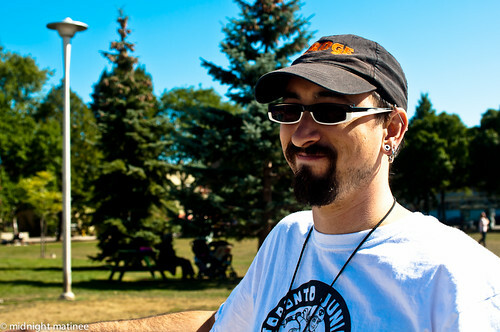 Lucid Lou and Mouth of the South have been among many players instrumental in the formation and coaching of Toronto Junior Roller Derby. The group was birthed and berthed at The Hangar in Downsview Park, then they along with the other tenant at The Hangar started looking for a new place to practice. TJRD settled into Jimmie Simpson Rec Centre in the east end of Toronto. Sunday Funday was a means to showcase their talent and Derby in the neighbourhood. “TJRD has a new home at Jimmie Simpson,” says Lucid Lou. “We hosted a scrimmage (mid-September) for kids and adult and had and excellent turn out from the community! The young Black and White teams on the track had their gameface on, make-up or not. They exuded confidence, ready to go into competition. 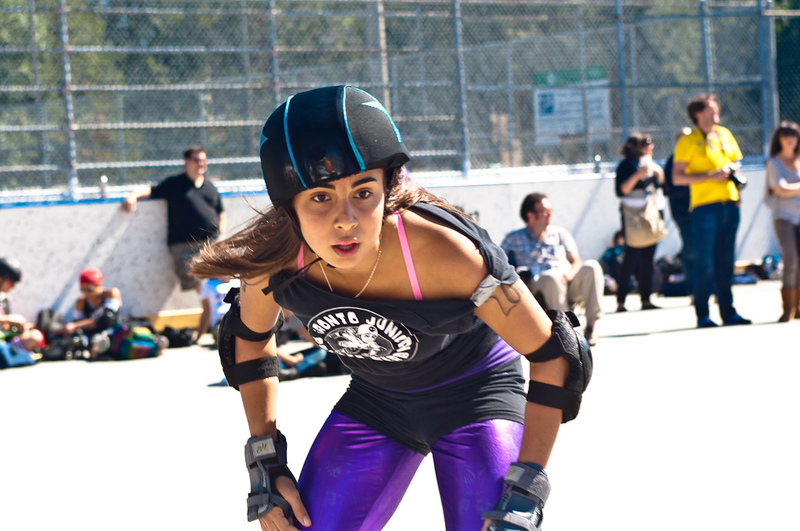 Their Derby names blazed in bold on the back of their shirts, and their faces replete with the warpaint. The teams played fearlessly, ready to take a hit, not scared to fall. With the rules being purportedly low contact and positional blocking, the ladies still looked ready to indulge in some full engagement, but held back. A lot of dazzling skating and crossovers at the corners by the jammers, even the tiniest of the skaters were outracing their older competition. It is almost astounding to think that a lot of the older talent were still in the twelve to thirteen year old range, playing wiser beyond their years. The coaches [12 Gage might have been the coach for white as she donned Hammer gold colours on the back and the logo from DDRD on the front, Lucid Lou coached the black side] were still preaching fun, and shouting out encouragement in the most sporting of ways. Veteran and senior coaches should take note how these young players responded to calm coaches at the bench. The players could actually comprehend a single voice instead of a rabble of din, and jammers gazed attentively at the bench and received instructions about going to the front, speeding up or slowing down the pack, and telling the jammers when to call it off. Although there were times the coaches were not heeded in the heat of the moment, or maybe the players could not actually hear their bosses from the other side of the track, the coaches did not display any frustration and only smiled at their players who in return responded to the bits of wisdom and praise as they returned exhausted to the bench. There were reminders that these were youngsters who sought out the advice of the coaches or asked questions about how and when to return from the penalty box, one or two minutes? It did not matter, all major penalties were one minute. The teams were learning rules and applying them on the fly, trying out new tactics, even taking the knee down during power jam situations and a bit of football style Derby springing the pack on the jammer line. Asking Lucid Lou why skaters did this, she noted that she had seen a lot of this practiced at ECDX. The jammer at the line was gently guided by her coach: “You know what to do.” So the jammer skated around the line in front of her and took off. It was indeed hot, and the heat was taking its toll. But the TJRD were having great fun and showed off their amazing Derby skills, mixed with a bunch of team spirit and utter fearlessness on the track. And coaches were ensuring everything was being kept cool and at safe levels. Lots of Derby savvy and awareness on the track as holes in the walls were open and shut and positional blocking squeezing the jammers out. The potential of these ladies is astounding and they will certainly knock around a lot of the current generation off the track in a few years as they grow up and graduate into the next step of Derby. As the juniors assembled for their postgame peptalk from the coaches, the more senior members of the TJRD Sunday Fun Day ensemble took to the track to continue the exhibition of Derby for the community and show the future stars more of what Derby skills had of their own and for the juniors to look forward to. The hour was approaching three and the magic moment of light during the day. The golden pale of the hot sun cast an appealing light upon the players on the track. The black and white team were forced to re-mix again as two whites showed up against an almost full minimum team of black. A brief reshuffle into shirts and two teams of six were assembled. 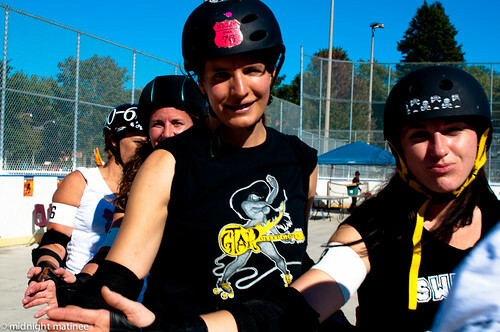 The teams configured as a mix of GTA Rollergirls in black and white along with Durham. eSkimoJo tried to rally her white cohorts during the warm-ups but Chicks Ahoy!’s Robber Blind seemed to take over leadership with her bites of coaching advice, mentoring the jammers to keep their legs moving and they’ll do all right. Black featured Betties, D-VAS, GTA and Durham. With the short benches, T-Ref asked if they should stop the 30 second countdown between jams and it was decided the teams would roll when they were ready. Who would be jammer or pivot was an on-the-spot decision. Unnatural jammers vied against unlikely jammers. Skating on the uneven cement surface proved easier for the younger set than the old ones on the track, but it didn’t stop the players from giving ‘er all and leaving ‘er all on the floor. Plenty of trips to the penalty box were welcome respites. The size of the benches and chairs reminded some of the players of being back in public school. Ten jams per period with a five minute break and all came to a sweltering stop. The final score on the wall was tallied by the TJRD and consigned to a chalk mark blown away in the wind. Sunday was not just another Funday, it was a good day to bring Derby into the community and no doubt attracted a new group of the piqued for the future, a future filled with this current generation of flourishing talent. May 14 marked a historic night in Toronto Junior Roller Derby history with its premiere bout, and first International bout to boot. The Mad Missfits from New Hampshire brought up eight of their team to The Hangar which necessitated some roster shifts so six Knicker Kickers ended up being on The Mad Missfits for the night. The rosters for the first Toronto Junior Roller Derby bout at The Hangar on May 14, 2011. 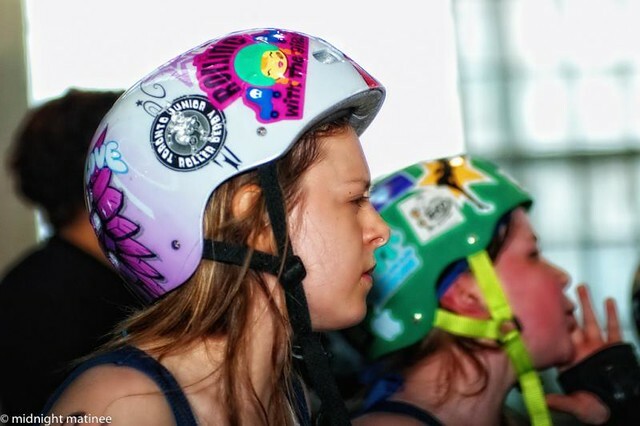 There was a definite GTAR connection to the Toronto Junior Roller Derby match as a parent or two of the players involved with the presences of Lil’ Trouble and Monster Mayhem. Leather Locklear of GTA Rollergirls Derby Debutantes had a match later on that night going against the visiting Royal City Roller Girls, but first she just had to see Lil Trouble in action. 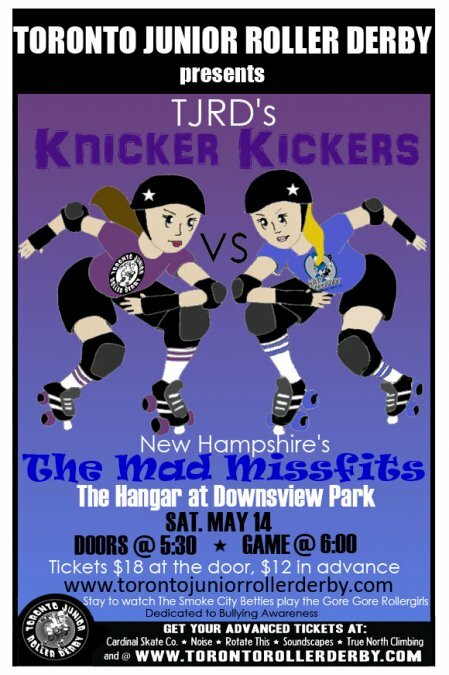 Due to rostering, Knicker Kickers split up their team and by luck of the draw, Lil’ Trouble was picked from the hat to be on the Mad Missfits along with Monster Mayhem was on the team of the Mad Missfits. 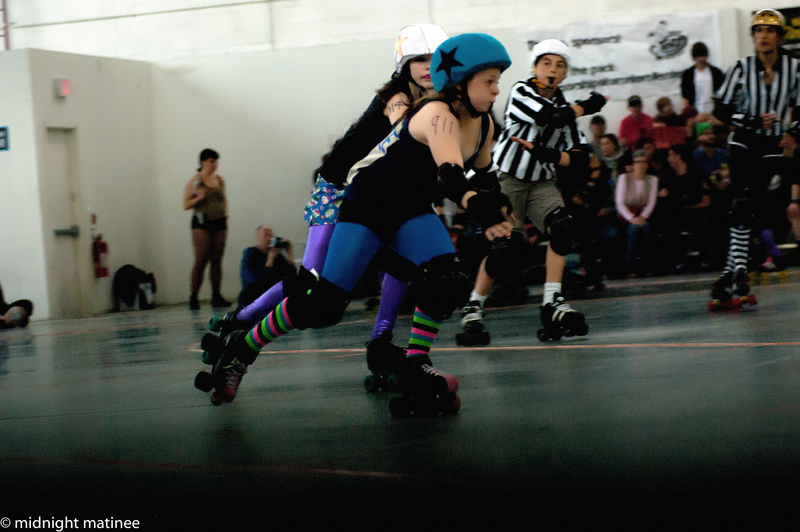 Lil’ Trouble found herself jamming at one point against Kamikaze Kupcake of the Knicker Kickers. The match was historical, being the first junior Roller Derby match at Toronto Roller Derby and the first international match at that. The final score was close 82 to 74 which was hardly what mattered. The action on the track was highly skilled and maybe surprising, players on the track showed a lot of adeptness and strong skating ability, with occasional falls or being positionally blocked out of play or onto to the floor. Thanks to DN for help with the rosters.